Do you know that Apple gave the iOS 12 Messages app a massive makeover with several choices that made iMessage on the iPhone a lot more fun? Now to be known as iOS 12, the new app will be more user-friendly and all-inclusive. No doubt, the new iOS 11.3 has many great features that will give you significantly more incentives to use for all your daily digital needs. Of the many new Messages enhancements in iOS 11.3, here are a few changes you should know. Messages on iCloud was supposed to bring to iOS 12 but the feature didn't make it cut. Developers discovered in iOS 12, but it doesn't mean that the public iOS 12 will come with this feature. But perhaps? Read all the messages as you sign into an iPhone, iPad or Mac. Deleted messages are deleted from all your devices. Attachments are stored in iCloud to save space on your device. iOS 12 come with Business Chat for users to communicate with businesses in Messages app. Businesses including Discover, Hilton, Lowe's and Well Fargo are supported. 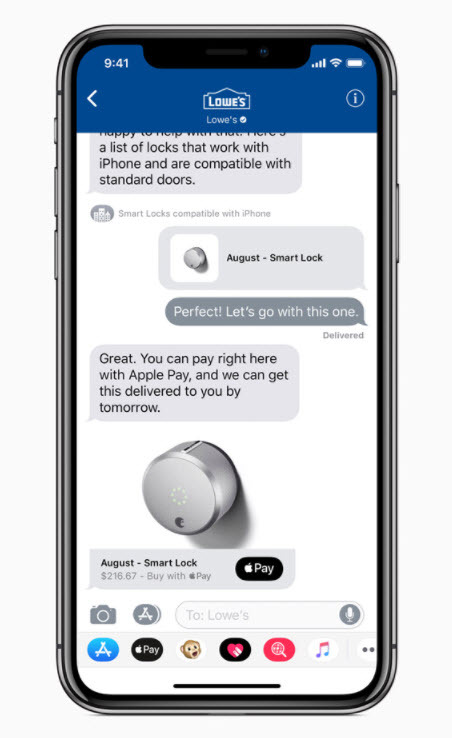 Business chat allows you to communicate with a service representative, schedule an appointment and make purchases via Apple Pay. But it won't share the user's contact info with businesses. This feature is only for iPhone X users. iOS 12 introduces 4 new Animoji, giving users to express themselves as a lion, bear, dragon or skull. Though the iOS 12 gives you the opportunity to delete message quickly, you may not be aware that your private messages are being viewed by someone else. This calls for vigilant, and to do this you need a software program to protect your privacy. First, you may want to know how many records you have deleted. This feature is not on iOS 12, but there is a free way to view your deleted messages. iMyfone Umate Pro is the only reliable tool you can use for this purpose. 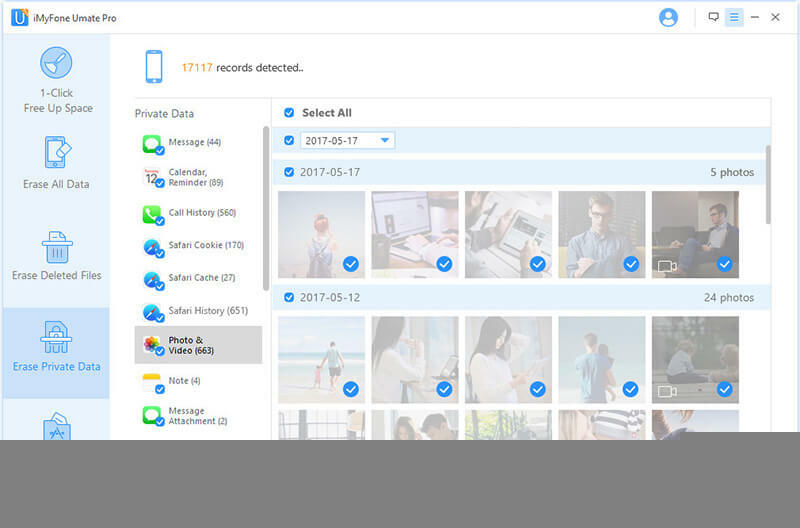 iMyFone Umate Pro or iMyFone Umate Pro for Mac is a third-party software that allows you view all deleted files or messages on your iOS devices. It then helps to delete them permanently without a chance of recovering them. Umate Pro protects your privacy and ensures that no matter how many iDevices you have, none of them will endanger your privacy. Erase Completely: Once a message is deleted with Umate Pro, it cannot be recovered. Thus, your messages will not get into the wrong hands. Erase Deleted Messages: Any recovery tool out there can be used by unscrupulous persons to access your deleted messages. However, Umate Pro ensures that the likelihood of someone accessing your message does not occur. 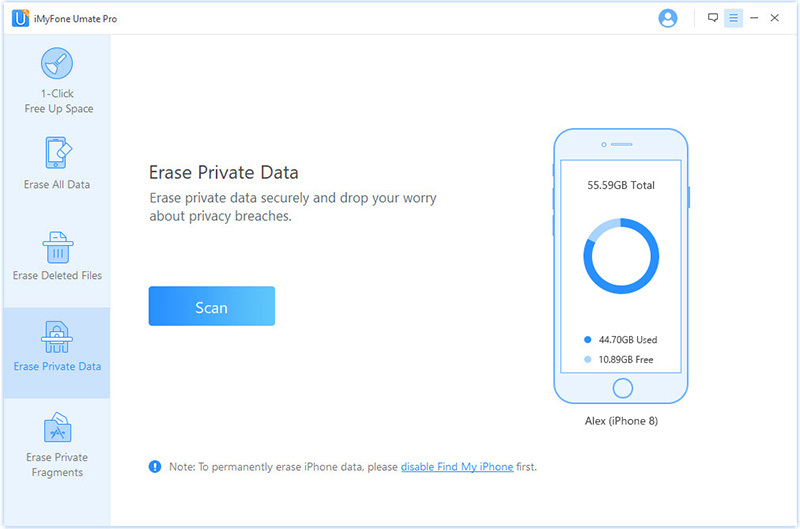 Erase All Types of iOS Files: All iOS files can be deleted using Umate Pro. Erase Third-Party Apps: Whatsapp, WeChat, SnapChat, etc. can be deleted easily with Umate Pro along with all data on these apps. Step 1. Download iMyfone Umate Pro and install on your system. Step 2. Connect suitable iOS device to the system via a cable. 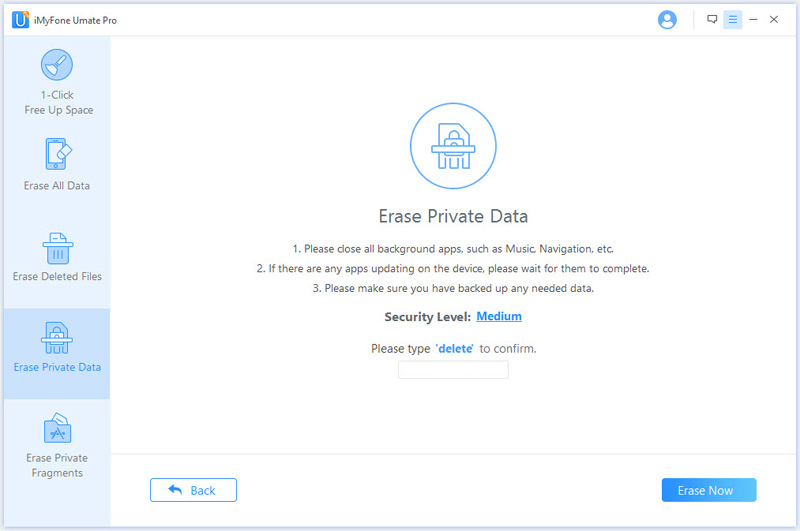 Choose the mode of "Erase Private Data". Step 3. Scan and preview files to be deleted. Step 4. Select the iOS 12 messages to erase and click on "Erase Now". You should also confirm deletion when asked.